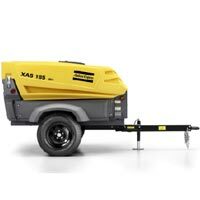 Atlas Copco’s small portable air compressor range are compact, efficient, economical and easy to operate. They give you a reliable source of compressed air to drive your pneumatic tools, as well as your high free air delivery applications such as sandblasting. All compressor models comply with current regulations concerning safety, exhaust emissions and noise. Ease of operation – All controls are located on a single panel for quick access and smooth operation. Long-lasting – Body parts are made of powder-coated Zincor™ steel for excellent corrosion resistance. The canopy can also be supplied in highly impact-resistant HardHat™ polyethylene. High efficiency – The combination of an efficient Kubota engine and the high performance Atlas Copco compressor element guarantees outstanding efficiency and reduced wear. Low operational cost, high fuel autonomy – All models are fitted with a stepless, fully automatic regulator. This constantly varies the engine speed according to air demand, reducing fuel consumption. The high capacity fuel tank allows the Series 7 to work a full shift without the need to refuel. Easy to service – All models are built with service in mind to ease in routine servicing and maintenance intervals. The result is fast service access to accelerate maintenance and reduce downtime. 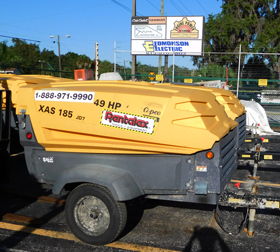 Low cost of ownership – The tough, impact-resistant HardHat™ canopy resists damage and corrosion, eliminating the time and cost of repair and repaint jobs.